transport rajasthan gov in Get Driving License Online from Driving Licence Rajasthan Transport Department has started Online facility for the people of the state How to Get Driving License Online from Any person who have motor vehicle or planning to drive any kind of vehicle must have driving license. Without have driving license, a person is not able to drive motor vehicle in public places. So you must have valid driving license. http://www.transport.rajasthan.gov.in/ is the official website of Rajasthan Transport Department from where the online application for Driving License may be submitted. 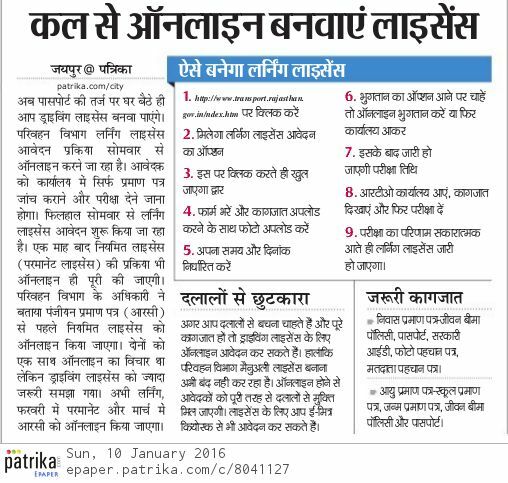 transport rajasthan gov in Get Driving License Online from Driving Licence Required Documents submitted with online Application form for Learner’s License. III. Residence Proof – The applicant can submit anyone of the following for the proof of residence. Pay slip issued by State or Central govt. iv. Age Proof – The applicant can submit anyone of the following for the proof of age. Application for registration of a motor vehicle.